You've been featured right here right now! 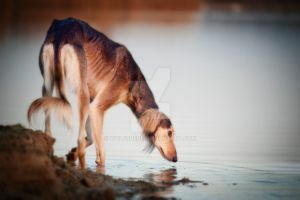 I have never met a Smooth hared Saluki in person! We only see the typical long haired ones here! What a wonderful range of colors. It's interesting to see how different dogs can be within their breed. My favorite coloring has to be the one in the middle. Gorgeous! I love the tri-colour especially! My favourite: the black'n'tan (or is it a tricolor?). Reminds me of my aunts hunting dogs. Short or long they are freaking gorgeous! I love that rich tricolor!